It was 90 something degrees, 80% humidity and I just finished cutting the grass, trimming and pulling weeds. I was beat. I did all this in my bathing suit because I planned to fall into the pool when finished. But first I stopped by the little fridge and grabbed something. I had bought this several weeks ago and still had 3 cans left. I fell into the pool then reached for the Dogfish Head SeaQuench Ale. This is a brew that I think deserves a hot day to be enjoyed. I don’t think I could drink this ale at Christmas. Or the Super Bowl. Or during a football game. This is one of the stranger brews I’ve had in a while. It tastes like a super sour margarita without the sweetness. This is a session sour. It is made with “lime juice, lime peel, black limes & sea salt.” This is one definitely tastes of lime and sea salt. One of the saltiest brews I’ve ever had. And this sour isn’t like your usual barrel aged sour that has some special bacteria or enzyme that turns the brew sour. This is a lime type of sour. Now I don’t know how the lime is added. I would imagine that adding lime juice to a brew when it’s fermenting would screw up the yeast and mess things up. And I can’t say I’ve ever heard of a black lime. Wikipedia says it’s basically a dried lime that has lost it’s water content usually from sitting in the sun. They turn black and they get ground up for spices. I’ve had a few black limes in the fridge that didn’t make it into a Tincho or a gin and tonic. I didn’t know I had some special spices on hand….. Anyway Wikipedia goes on to say it’s used to add sour flavors to dishes. This beer tastes like lime and sea salt. Period. I enjoyed it as I cooled off in the pool. But I have to add that I probably drank it faster than you should a session ale and I felt full. On a hot day I can drink about any typical summertime ale and be ready for a second. Not this one. I felt full. Weird. It’s only 4.9% BV and an amazing 10 IBUs. 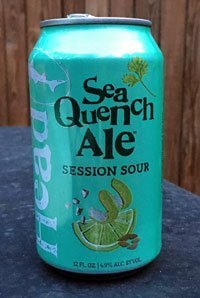 Here’s what I found on their website: “SeaQuench Ale is a session sour mash-up of a crisp Kolsch, a salty Gose, and a tart Berliner Weiss brewed in sequence with black limes, sour lime juice and sea salt to make this the most thirst-quenching beer Dogfish Head has ever brewed. When we opened our geographically-enamored seafood restaurant Chesapeake & Maine in 2016, we wanted to honor its coastal roots by developing this sessionable, seafood-pairing beer that takes you to a place of brinyseawater on sunny beach days.Our experimentation focused on three thirst-quenching styles with German roots, but no single style quite hit the mark and mood we were going for … so we blended them and the result was the tart and refreshing beer we were looking for! Partnering with the National Aquarium, we replicated sea salt sourced from the mouth of the Chesapeake Bay and added sea salt from the coast of Maine to honor the Atlantic coast we love so much. Sorry. This brew doesn’t quite totally quench my thirst. The saltiness wants me to drink more… but more water. When I first bought this brew some of Mr. Ben’s crew was over and had one with one of the moms while the kids swam. (This was perfect because we only allow cans around the pool). When she saw this brew she knew what it was and said she would love one. She did like it. I’ve always liked Dogfish’s Raison d’Etre for my turkey wine and their Punkin Ale and their Oak-Aged Vanilla Stout. (Never have been able to find their “Beer for Breakfast” which has some bacon flavors to it… gotta be good). I like this brew but can’t say it is my new “grass cutting” beer.